In the meantime, here are skate pictures! 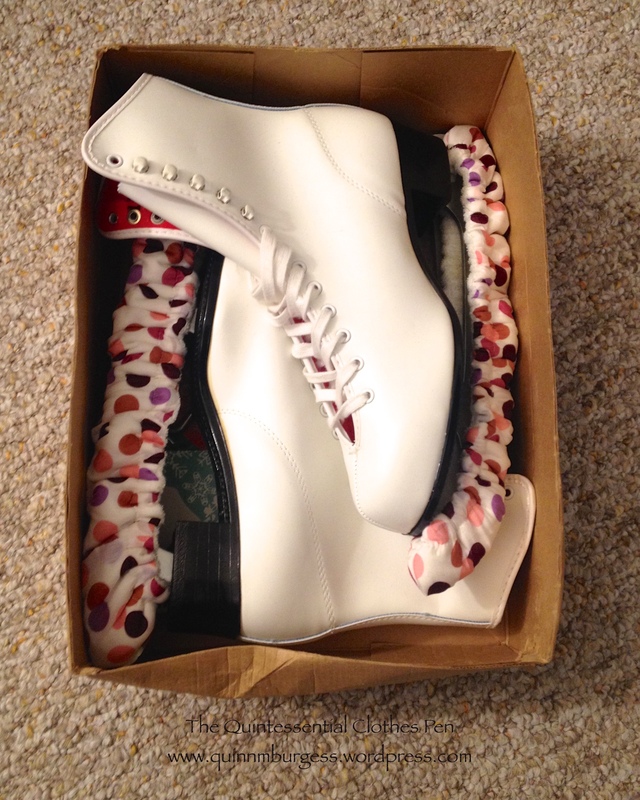 I bought vintage skates from Etsy. I’ve never bought ice skates before, so I was definitely guessing on the size. I gauged the size partly based off the size 8 skates I wore in January (too small) and also asked the seller for the length of the boot before purchasing to compare to my foot length (he sent me pictures with a ruler, very helpful!). It worked out and the skates fit! We’ll have to see how they work out once I’ve been in them for a bit while skating. 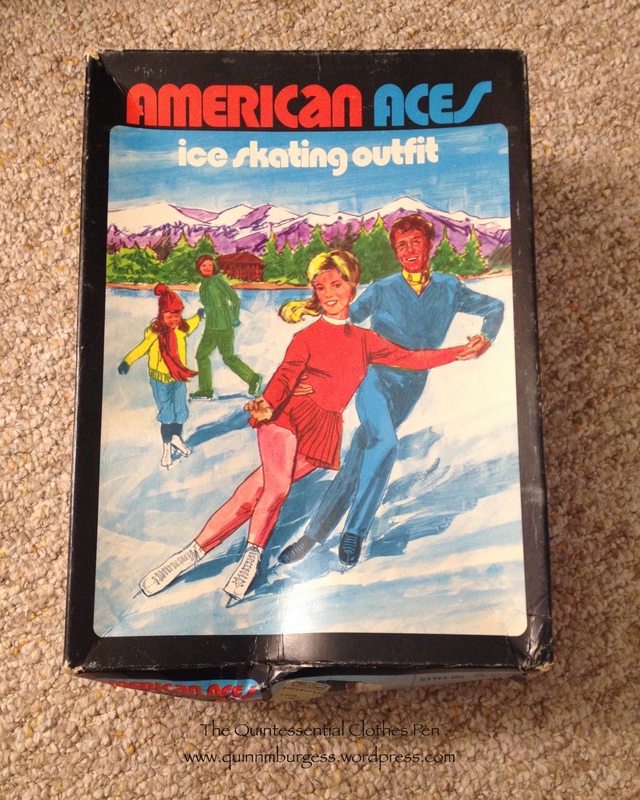 I’m guessing these skates are from the 1970s based on the clothing of the illustrated skaters. If anyone has thoughts I’d be happy to hear them! 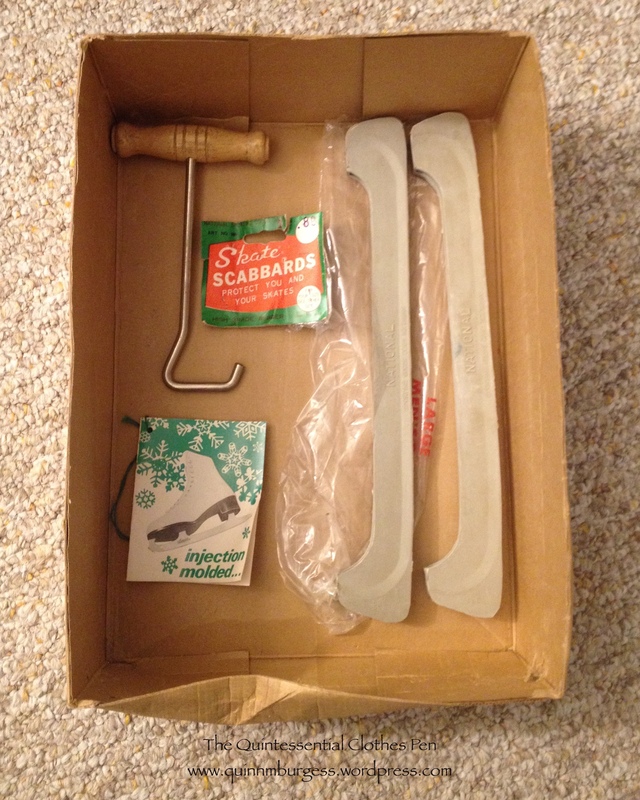 They came not only in the original box, but also with their tag, skate scabbards (and packaging) and a hook-y thing. Does anyone know what the hook-y thing is used for or what it is called? Do I carry my skates with it? I feel a little silly not knowing what it is, but it’s a cool thing regardless, all wood and metal. These skates have never been worn! The only time-damage was on the tongue lining, which had been glued originally. The glue had entirely disintegrated, leaving a dusty foam behind. I cleaned it off and re-glued the tongue lining in place. So far it seems to have worked beautifully! One soaker on, one soaker off. This is the tutorial I followed for making my soakers. It was super easy. I had to piece my fabrics because the scraps I had were small, so that added some time, and I made my towel two layers thick since it was thin terry cloth, which added a little time and bulk, but those are the only things I changed. The polka dot exteriors are scraps from my 1953 Polka Dot Dress and the terry cloth linings are cut out of a failed robe I made years ago when I was first learning how to make clothes. Yay for repurposing! I love how silly and girly they are. They make me smile! Plus, I don’t use elastic for many projects of my own, but I happened to have just one piece in my bag of random scrap notions that was the perfect length, so the whole project was free and from my stash! 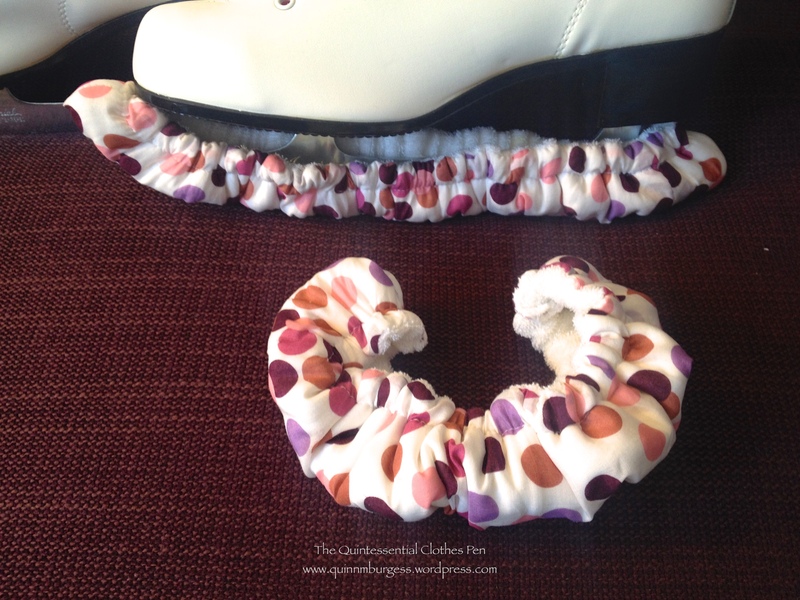 This entry was posted in Crafty Guides, Shoes and tagged Ice Skates, Skate Soakers. Bookmark the permalink. What a find! I would definitely have the skates sharpened before using. Skating is part of my distant past as I grew up in Michigan. I can recall getting a set like this for Christmas in the late 60s. The handle is for carrying, you are correct. But most people back in the day tied the laces together above the boot and carried them over their shoulder (one to front, one to back). Keeps hands free for hot chocolate! If I recall, skates are not sold sharpened. That’s not to say that the person who originally bought these didn’t have that done… but to be sure, I would put a new rub on those blades. Unsharpened blades can “stick” on the ice and make you fall. It doesn’t work like you are thinking (I’ll be slower while I learn this thing), so please be careful and sharpen those skates! Thanks for the tips, Darline! I think the hook is for tightening the laces for serious skaters. After hand tightening, you start from the bottom with the hook as the gizmo gives a lot of leverage. Pros want very tight laces to support their ankles during jumps. At least, that’s what I heard in interviews with Olympic skaters on TV. Take your skates to any sport shop for sharpening; if the shop sells them, they probably also offer sharpening. Happy skating! Oh, that’s an interesting idea for the hook that I hadn’t considered. Of course, I won’t be jumping (haha! ), but having tight laces last time did help. Thanks for the tip about who might sharpen the skates for me! How neat! I saw vintage ice skates for a guy at a thrift store recently. Thanks so much for linking back to my tutorial! Your skate soakers look great 🙂 I love the polka dots! The skates look lovely. Good luck! 🙂 Thank you! I’m pleased you were able to see the results of your helpful tutorial! That’s always fun. The hook is probably a lace tightener, as Donna mentioned above. Mine is modern and folds up like a swiss army knife, but a handle like the wood one would probably be even better! Also yes, sharpen those skates. Even if they were sharpened to begin with, they probably need it. Hm, I’d be interested to see your lace tightener to compare them. Maybe I’ll bring mine and try it out. The skate sharpening at the Frog Pond does seem fortuitous, since sharpening the skates seems like a thing I should be doing! 🙂 Thanks for the insight! Also adding: my skates need to be sharpened, so I was poking about…the Frog Pond rink offers skate sharpening for $8! I foresee exciting adventures where lots of ice is involved 😉 What a lovely purchase! The hook is definitely for tightening the laces. Also, skates only very rarely come pre-sharpened, $8 is what is costs to get your skates sharpened in Saskatoon too. Some rinks have machines that sharpen skates automatically, but I would not suggest that for the first time. But, as someone else suggested, any sports store that sells skates will do sharpening. I’m a Canadian and have skated all my life. I’ve never heard of scabbards or soakers; we just call them all blade guards. I just keep a tattered old wash cloth with my skates to wipe them off after skating. Be sure to store them with the guards/scabbards off, moisture can collect in the guards and the edges will rust. Have fun with you skates!